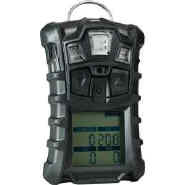 MSA's Altair® 4 Series is a super-stout, competitively-priced, personal multigas detector. Highlights include the exclusive optional MotionAlert™ feature, triple alarms, and IP67 rating independently certified. The Altair 4 Multigas Detector identifies LEL, CO, H2S and O2 gases, raising the standard for personal multigas detectors with features you won't find in competitive models. Other features include audible, visual and vibrating alarms; large buttons for easy operation and a high-contrast display. Units come with a lithium-polymer rechargeable battery for 16 hours of run time between charges. Two-year warranty.